Yogi Bear is a family cartoon character who has appeared in numerous comic books, animated television shows and films. He made his debut in 1958 as a supporting character in The Huckleberry Hound Show. 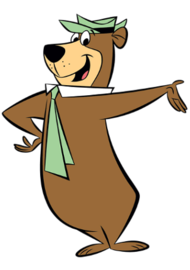 Yogi Bear was the first breakout character created by Hanna-Barbera and was eventually more popular than Huckleberry Hound. In January 1961, he was given his own show, The Yogi Bear Show, sponsored by Kellogg's, which included the segments Snagglepuss and Yakky Doodle. Hokey Wolf replaced his segment on The Huckleberry Hound Show. A musical animated feature film, Hey There, It's Yogi Bear!, was produced in 1964. Yogi was one of several Hanna-Barbera characters to have a collar. This allowed animators to keep his body static, redrawing only his head in each frame when he spoke. This reduced the number of drawings needed for a seven-minute cartoon from around 14,000 to around 2,000.